my little garden in japan: World garden, the best of your garden! 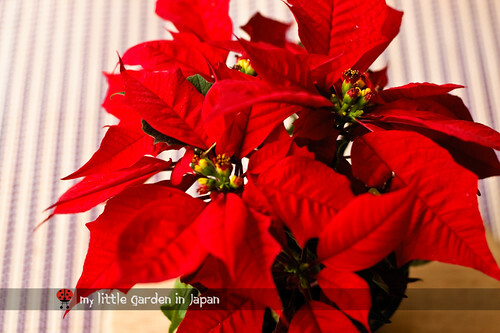 My favorite plant now is nochebuena (poinsettia) and yours? World garden, the best of your garden! 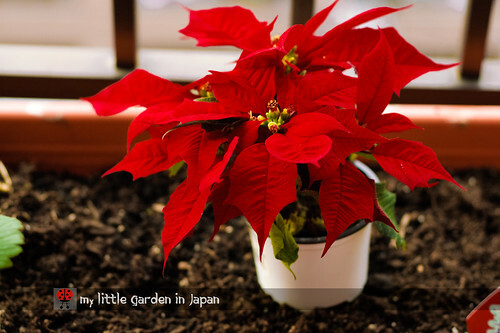 My favorite plant now is nochebuena (poinsettia) and yours? Time for the carnival. I hope we get a lot of nice plants to showcase. First of all want to thank everybody! I started this blog just as a little journal of what my little garden has gone through, but I have gotten such a nice response and a warm welcome from fellow gardeners all around the world, that it have become much more. I set some goals at the beginning, to be completed on three months. All to decide if I should continue, or if it was just a nice experiment. I hoped to have more than 1000 unique visitors, have one day with over 100 visits, pass the 10$ in advertisement (to cover what the domain costs ), and have 50 followers on Twitter. I am very happy to say, thanks to you, pretty much all of the got accomplished. This blog is a bit past its three months, and so far we have 1,123 unique visitors, with the day with more visits being November 15 with 112 visits. We also reached the goal for advertisement, and are just two followers shy of 50. 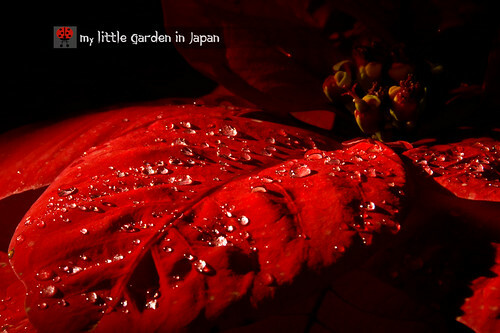 My little garden in japan has grown so much because of your comments and your visits. It is quite an encouragement . I will keep up with this little project and I hope you will continue to follow my journey. So, once again, thank you very much! Here is my little attempt to give back to the online community. A little blog carnival so everybody get to know each other and show their beautiful gardens and plants. Ok, here is my submission to the carnival. I hope is the first of many to come. My favorite plant now is my nochebuena (poinsettia), which I got back when I got the rest of the flowers. I really like this plant. First, because is native from Mexico, which makes me a little proud; second because it represent this winter holidays, which are one of my favorite seasons; third, and most important, because it makes me remember my garden in México. Back at home, my mom and I used to go get some nochebuenas every winter. They look beautiful at the entrance of our house. It was one of the little traditions of the holidays, one that I sure loved. We tried to keep some to last for next season, but they mostly burn down in the hot days of summer. They are meant to live in the colder weather of south Mexico. There is where they really thrive, I have seen trees of nochebuena (poinsettia) down there. Then, being here in a more tempered weather I had to get some. I also was fascinated by the many kinds of nochebuenas (poinsettias) they have here. They have some pink ones, some shaped like a tree, some mini ones, and some even are sprinkled with glitter. I don’t know if mine will last the season, but I certainly hope it does. Now is your turn, which is your favorite plant? I disabled the links temporarily to make room for the new carnival. Please wait while I upload the old links into a list. For the blog carnival, please input a link to one of your posts on the little widget below. Just click the blue button that says add your link, add a comment if you like and let us see which one is your favorite plant. Fer, your Poinsettias are so Christmassy. I have seen these plants growing to the size of substantial trees, in the hills of Nepal, where presumably the climate suits them well. Congratulations for launching your new project! Will you hold the carnivals monthly? Hi, I thought this was staring tomorrow but I have added my link anyway. Look forward to seeing what else pops up. By the way I've linked to the actual post rather than my blog is that correct? Takaeko~ I don't know if I should make it a monthly thing yet, but I do want to have one now and then, I guess we will see how this one does and go from there. Hi Fer, I did not realised that you were going to start the carnival blog today.Lucky! Nochebuena is a very pretty bright plant. No problem Fer - except I'm a day older in Japan!!! Phew, I'd left myself a note that you were hosting this and STILL nearly forgot! I've added my contribution. Thank you for setting this in motion! I don't normally like Poinsettias, but hearing your story makes such a difference, as does realising that they are a native "proper" plant in your home country. Here they are sold in motorway service stations and garden centres and just always look rather artificial to me. I much prefer them on the steps of your home in Mexico! Hey Fer, I'm confused with the message you sent me about the blog carnival. I included your strawberry post with the carnival I posted today, but maybe you meant for me to include this poinsettia! That first photo with the water droplets is gorgeous -- like velvet! I'm sorry if I got it wrong, but I hope you'll come visit and see the post I did include. I'm not sure why I never received your entry, did you use one of the two forms provided to send me the link? Hi Fer, love your gorgeous Red Poinsettias! Congrats on lauching your Blog Carnival! Fer, Congratulations on all your achievements! You are learning fast and growing fast. I love poinsettias too. If you hold the carnival at specific timing, e.g. every month-end, others will know and prepare well. If it is erratic, you need to inform everyone of the next one by means of a post in your blog or a message to each and everyone, so this will take more of your time. However I picked one that is very much Canadian and that is perfect for this ! Here I came with two blogs! One is mine and one is shared. Also please keep blogging. Your little garden is admirable and beautiful. Wow, you've accomplished so much in 3 months! You have a real talent for blogging. Thanks for hosting this carnival, it was wonderful to look back at plants and decide which was my favourite. 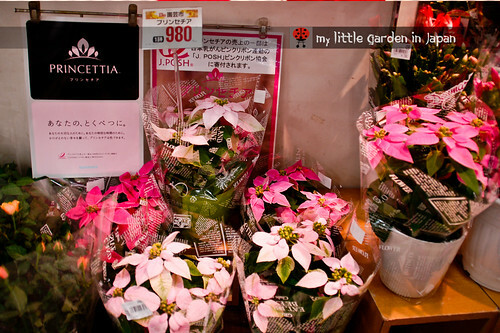 That is very beautiful poinsettias!!! I love the striking red colour! It definately add colour in winter! You've done a great job! Glad for your success. Thanks for hosting the carnival. It's a great theme - I'm looking forward to seeing everyone's plant picks. Hi Fer...You done a great job. Congratulations on your achievement! Wonderful carnival! I don't have anything to show, I hope to be ready for next one. Nochebuena is very popular plant this time of year, and so very pretty. You must know it's hard to choose. ONE of my favorites is Helen's flower for summer blooms. It has been an incredible turnout. More than I could hope. So many beautiful plants! For some reason, Poinsettias are associated very strongly with Christmas here. Clearly, they are bright and cheerful in the cold of winter but, as they are not native, it is a surprise how closely they are linked. I hadn't realised they could be trees! I enjoyed this post because it's given a little glimpse of your life 'back home' in addition to what we usually see of your balcony in Japan. We have managed to keep a pointsettia around the year which was fairly easy but to get it to go red again was trickier. The length of daylight hours needs to be controlled so I was having to cover it with black polythene at certain times of the day. It involved rushing home from work to cover it and uncovering it in the mornings before going to work. Only did it once - just to see if I could!! As for frequency of blog carnivals - everyone has their own views but mine is that if they are too regular then you lose the sense of occasion and it can become a chore after a while and lose its interest. I love your first photo. I didn't realise they came in other colours, I've only ever seen the red. Thank you very much! We have been getting so many submissions. Jo~ In mexico we have white, red and a couple shades of orange, but I must admit pink I have only seen in japan. Fer, I really like the blogroll thing you're using for your carnival! I think I'll try to find something like that for the one I'm running. That is a nice "game", and I will participate the next time. Fer, will you be continuing this on a regular basis? I was a bit unorganised this time but finally made it. It's great to see all the fabulous plants. 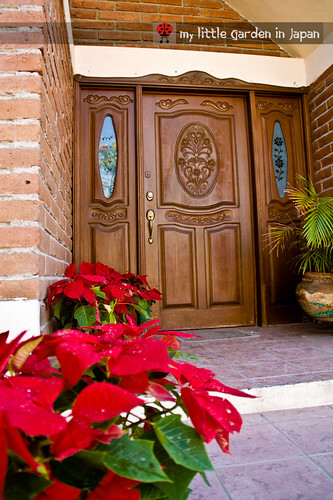 Love your poinsettia photos, and so Christmas-y for some of us. Great idea Fer. A friend gave me a pretty red poinsettia last Saturday. I had to put it up high because our cat, Butterscotch, was a little too inquisitive. I am familiar with the fact that some varieties of poinsettias are native to Mexico and you should feel proud about that. Where I live, it is way too cold this time of year to set them out by the front door like the ones in your lovely photo. In fact, we have to cover them to carry from the store to the car and then again from the car to the house. I don't have time today to share the best of my garden, but hope to do so in the future. Fer, thank you for visiting my grandson's blog, Diary of a Coo Coo Kid, and leaving a comment. Very thoughtful thing to do. Fer, Congratulations for achieving most of your goals!!! Very happy for you. There seems to be a lot of fun going around too. Hi Fer, poppy can grow up to a metre tall. I hope you will have it somewhere in your plan. what a nice carnival, thanks for starting this especially during the winter when everyone can reflect on many of their favorites. This is my first visit to your blog. So interesting! I love the idea of posting our favorite plants. I have posted one that was still blooming recently before the snow and hard frost we had. 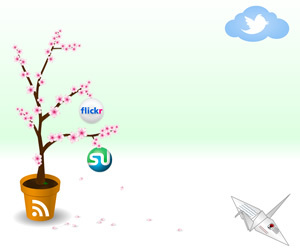 What link back and blog title would you like us to use? And congratulations on having, and reaching, your blog goals! You know how to throw a carnival! It was fun getting to know some new bloggers that I otherwise would not have known. Hi Fer; Just wanted to say a big Thank You for hosting the blog carnival. The pageview rate on my blog has been about twice as high as usual! It's also made me aware of a load of other blogs that I had not previously discovered -- which is exactly why you started the whole venture. Great work! What an interesting project! I really like it so much! I joined with my favourite plant: Clematis. Thanks for hosting the carnival of favorites plants and inviting me to participate! Took me a while, but I finally got my post done and added my link above (and here). I hope you check it out. Hi Fer, Your carnival was a spot of genius.As for my addition, I honestly have never had so many enquiries and comments, thanks for doing this, I am a total fan. Just an observation but some of you haven't linked your posts back to Fer's Carnival or mentioned his blog in your posts. After he has taken the trouble to organise this I think he should have some credit for it don't you? Hi Fer, just submitted my favourite plant! Congratulations on your achievements. Your poinsettia is gorgeous! Love the vibrant colour. Thank you for hosting this great carnival! Hello there, I am 40 to come to your fun flower carnival. Cool idea. Hi Fer, I also have seen a green poinsetta which is also lovely. I'm still thinking which is my favourite, it's like being asked to choose between my children! I am so pleased you joined the blogosphere and can see that your experiment is successful. Your blog is interesting and original and that is why it is so popular. Such a lovely idea, especially at this drab or snowy time of year in the Northern hemisphere. I'll enjoy visiting the other favourites. Hello everybody! thank you very much for your post and for joining the carnival. I cant believe we pass the 40 mark! Also, I am sorry I disappeared a little this last days. I suddenly got very busy. I promise I will visit those blogs that I haven't and reply to all the questions and comments. Thank you very much for joining us. I am so glad I ran across your blog. I am hoping to join in on future carnivals and I am enjoying reading your postings. Thank you for such a wonderful site!